Hello! In this week’s newsletter, I am taking you behind the scenes of how to create a hand crafted three dimensional lettering piece using found objects. I’ll give you some tips on crafting your lettering and composition with pen and paper, and walk you through the process of recreating the piece in the third dimension. This was actually my first time creating a three dimensional lettering piece, so this is definitely not the only way to go about it, just the way that I approached it. To begin, I decided I would hand letter the word “Coffee” in a bold script and use coffee grounds and beans as the three dimensional medium. But before working with the coffee, I took my time to craft the lettering and composition. 1. Initial Sketches - Sketch small and find reference for the style you are going for. These are just about an inch in scale. Working small will prevent you from getting bogged down in details that you shouldn't be thinking about yet. The purpose is to try different approaches to your style. I didn't spend an exhaustive amount of time experimenting with different styles, because I knew that I wanted to keep the lettering pretty simple and execute it as a bold script. At this early stage in the process, it is important to just have fun with your sketches, but I do recommend finding a reference image for the style you are trying to achieve. Having a clear idea of what you are trying to do will shine light on the ambiguity of the creative process. 2. Refined Sketches - Start sketching larger to hone in on the details. The next step is refining a couple of your initial sketches at a larger scale. Don't work too big, because it will only become harder to handle the letters and proportions. The scale at which you work might be best determined by the size of the tool you are using, but generally, you might now be sketching at around 4" - 12" depending on the length of your word. You can also limit your canvas size to 8.5" x 11". Working at a larger scale will allow you to pay closer attention to the weight of your letters (how thick they are), the spacing between them, and the ways the letters interact with one another. For this project, I wrote the word "Coffee" with a Pentel Color Brush to lay down ink and to determine the weight of the letters. In a future post I will write more about the importance of learning calligraphy and how it will expedite the refinement process. In the meantime, If you don't know what the pentel color brush is, check out my previous post here. While refining, I traded off between using the Pentel Color Brush and a pencil. I will often use the pencil to make revisions by altering the outline of the letters, and then fill in the outlines with the Color Brush. Although I sometimes fill in the letters using graphite, I find that the brush pen fills in the letters faster, saving time. After refining both of these sketches, I decided to move forward with the sketch on the right, because I thought the letter "f"s were more legible, and I liked how the descenders hug the letter "o". To further refine this sketch, I simplified it by removing the flourish below the letter "e", and compensated for that empty space by replacing the capital letter "C" with the letter "C" from my previously abandoned sketch. This new "C" filled that empty space below the letter "e"s, and fit nicely tucked in to the space above the letter "o". This new letter "C" was also accommodating for the descenders of the letter "f"s.
3. Plan your composition - Consider the context for your project / design a composition around the lettering. Now, with the lettering refined, I started to consider how I wanted to craft the composition around my lettering. I referred back to one of my initial sketches, and decided to house the lettering in an oval shape, and to create ornamentation within the oval by dividing the space around the word evenly within the shape. To draw a perfect oval by hand is a difficult task, so I opened up Adobe Illustrator to create a perfect oval the size I needed for my lettering. I then printed the oval, traced it around my lettering, and then began to divide the space. After I thought the spacing was looking good enough, I broke out the Pentel Color Brush, and traced over the graphite to add contrast and weight to the lines. Next, I decided to add to the composition outside of the oval, so I could incorporate coffee mugs into the composition. I quickly sketched out a kind of gestural representation of what I was going for. Now, similar to the way I refined the lettering from a thumbnail, I transferred the oval design to a large sheet of paper in order to work out the details of the new addition to the composition. Above, you will see I added 4" on every side of the oval and divided it both horizontally and vertically. I then approached drawing the additional flourishes as a unit that would eventually be reflected to create a symmetrical boarder around the oval. 4. Adhere drawing to table - Make sure drawing is secured in place so it does not move later on. Now, with the additional flourishes reflected around the oval, I secured the final drawing to a coffee table to make sure it wouldn't move while I was working with the coffee. 5. Work with your 3d materials! - Get a feel for the material you are working with by experimenting. If you are working with a spice or something like coffee grounds, I recommend using a small butter knife to direct the material. Below are a few tips for working with a material like coffee grounds. Once again, Here is the final piece! I realize that I didn't go into detail about photography and image editing. This is partially because this article is already pretty long, and I plan on sharing some photo editing tips in a future post. Also, if there is anything you think I can improve about the way I set up this newsletter, don't hesitate to reach out and let me know. I want to know so I can make it better for you guys! Thanks for taking the time to read! First of all, I want to thank you for subscribing to my Lettering and Design newsletter! My aim with this weekly newsletter is to push myself to further develop my voice and to share knowledge more openly. I hope to shine a light on some of the things I have learned over the years working as a professional designer and lettering artist, and I hope to inspire thought and conversations around lettering and design. Thanks again for joining me in this journey! 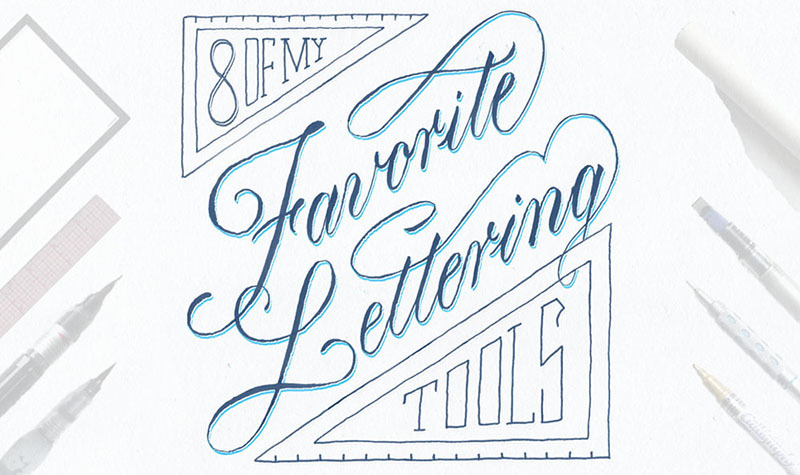 Before I jump into showing you my 8 favorite lettering tools, I would like to quickly introduce myself! My name is Ray Mawst, and I am a graphic artist currently living in Sun Prairie, Wisconsin. In short, I graduated with a BFA in design, moved out to New York City to work as a designer in a branding company for 2 years, and now have moved back home to Wisconsin to focus on building my freelance career as a lettering artist. So with that said, let’s talk about some lettering tools! 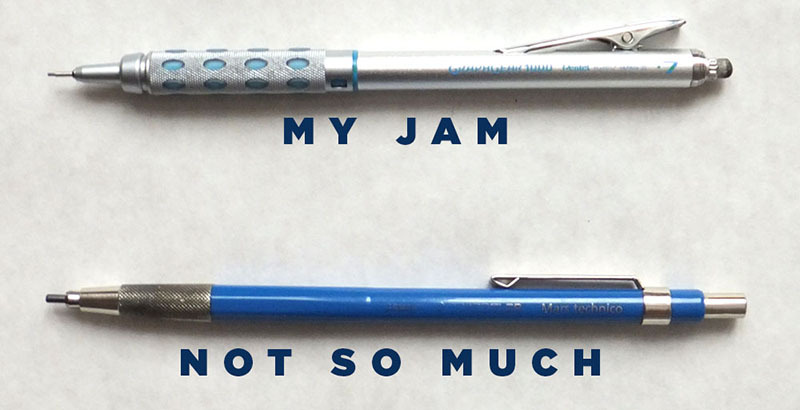 This is my favorite pencil ever, and here’s why. It never needs to be sharpened, and when working through a lot of sketches, I find this to be a time saver. Also, notice that the tip has a thin metal lead stabilizer. This prevents the lead from breaking as easily as a conventional mechanical pencil. For a while I used the Staedtler Mars 780 Technical Mechanical Pencil which I know a lot of lettering artists swear by, but I wasn’t a big fan. What turned me off was how quickly the lead flattened out and how often it needed to be sharpened. Look at how blunt that tool is! After a few minutes of use, that is what it dwindles down to. Too thick to work with. As far as brush pens go, this is my favorite at the moment. With very light pressure, you can write super thin lines, and with more pressure you can get a mark with a substantial width. If you have ever used a Tombow brush pen, the way this pen writes is a bit different. As opposed to the Tombow and its felt tip, the Color Brush has a nylon brush tip. This is favorable in my opinion because the nylon doesn’t wear out like the felt tip of the Tombow. It takes some practice to become more precise with the mark making, but in the end I think you gain greater control with contrast between the thicks and thins. Well, I hope that you got something out of this! This is my first time ever creating a newsletter, and I want to make each post interesting and worth while! If you have anything you would like for me to write about , I would love to hear about it! Also, if there is anything you think I can improve about the way I set up this newsletter, don't hesitate to reach out and let me know. I want to know so I can make it better for you guys! Thanks for taking the time to read this all!